We use 8% of the world’s oil supply to make plastic, including billions of plastic bags each year. Not only is this a huge waste of resources, but it results in tons of unnecessary long-term landfill. 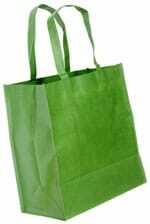 Take a reusable shopping bag with you when you shop. Better yet, keep a few in the car so you’ll have one whenever you need it.